The characters in this series, Genevieve Lenard, are people I would like to call friends! What I liked: The Leger Connection, while having all the same stars is more about one of the co-stars than Genevieve (Jenny) and I loved it. We finally are introduced to a bit more of Francine's past life and her priest father and nun mother. Yeah, there's a good story in that sentence. The team of characters Ms Ryan has put together in this series makes reading it a joy. There's always a plot about paintings but includes other items that are stolen and it's the team's job to work together to solve the theft and apprehend the "bad" guy. For me, while the plot is intriguing, the characters make the books worth reading. We have an autistic heroine, an art thief, a hacker extraordinaire, some muscle who cooks like an angel, an Interpol agent, an art student orphan and an art insurance company owner all working together. That's an eclectic mix and Ms Ryan seamlessly blends them together. The thing is, as readers, we still don't completely know all the backstories of each character but Ms Ryan is getting there with every installment in the series. 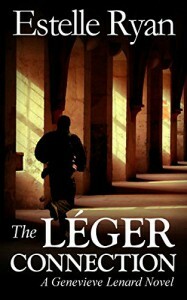 In The Leger Connection, Colin (the art thief and Jenny's love interest) takes the team to task in the way they tip toe around Jenny with her autism. In ways they don't see until Colin points it out, they are isolating Jenny without meaning to. Francine's (the hacker) baiting of Manny (the Interpol agent) takes an unexpected turn in this story. It took me completely by surprise but I should have seen it coming. What I didn't like: While not my favorite of the series, I still enjoyed it. It's a little slower paced than some of the other books but I enjoyed the character interaction much more.